Last week I wrote the first post in this series on attitude’s role in how to contact your spirit guides. This week in How to Contact your Spirit Guides: Part 2, we’re going to talk about tactics. My previous post on how to recognize your intuition will be very helpful here, because as I mentioned in last week’s post, you’re already connected to your guides. You always have been. They’ve been communicating with you all along, you just haven’t fully recognized it. There’s several ways you can go about connecting and communicating with your spirit guides. This is probably the easiest and most common way. Simply state your intent before you go to sleep, and then record your dreams the next morning. Pay attention to symbolism because dreams are not always straightforward. You can use a dream dictionary like Dreammoods.com to look up the meaning behind certain symbols. I’ll be offering a dream interpretation course later this year that will teach you exactly how to connect with your spirit guides in a dream space, and even better – how to figure out the meaning behind your dreams. You can sign up to be notified when the course becomes available. Click here. 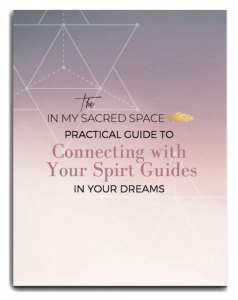 I’ve also written a free ebook, The Practical Guide to Connecting With Your Spirit Guides In your Dreams to help you learn how to contact your spirit guides via dream state. Obviously meditation is another go-to for those who want to connect with their spirit guides. I could probably, again, write an entire post dedicated to using meditation in this fashion. Maybe I will in the near future. If her voice doesn’t resonate with you, search through a few videos until you find one that does. If you notice repeating patterns – numbers, names, words, phrases animals – it’s usually a way of getting your attention. If you’re noticing it (without looking for it) and it seems to be sticking out to you, then it’s most likely a sign. Got any other techniques to add? Let me know in the comments! My guides or peeps as I sometimes lovingly call them use the radio in my car very frequently. They know I am “tuned” in when driving. I happen to have satellite radio and a digital screen now. On the way to a mediumship development class I attend the last two times I was given messages. The first one was a song titled “Angel in my pocket” and the second was the artists first name”Bruni” my mother’s name was Brunilda and went by Brunny. All I have to be is tuned in. Thanks for your wisdom!